One thing I’d like to make clear before going any farther: there is no right or wrong way to draw. While I firmly believe that everyone should learn to draw, how they draw is a matter of personal expression. Many beginning students want to learn to draw realistically and often compare their work to a photograph for accuracy. Photorealism is an admirable style of drawing, but realism in and of itself is not paramount. What matters most are expression and understanding. Drawing lessons are beneficial because they develop seeing skills, a knowledge of line, form and composition, familiarity with various mediums, as well as original thinking. The more we learn about drawing, the more we see the infinite spectrum of creativity. My own style varies depending on what and where I’m drawing. 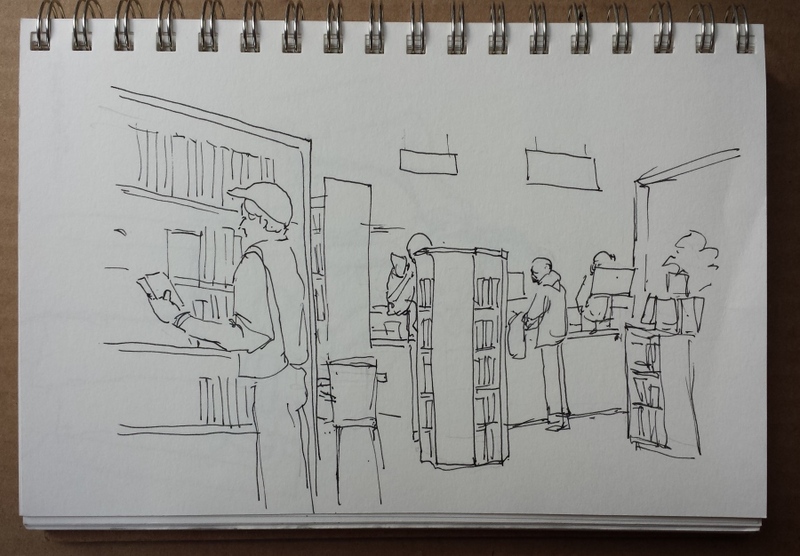 If I’m out with a sketching group drawing at the local library, as we did last week, I’m doing quick studies to capture the essence of place. For me these quick sketches are excellent practice – rather like practicing scales on the piano. If I’m in my studio working on a piece for an exhibition, I’m drawing slowly and deliberately. I might do several drafts and put in many hours before the final piece is ready. In both cases I judge the finished work to be a success if I have conveyed an idea, expressed what I was feeling or even succeeded with a challenging subject. When I was working on this forest scene I wanted to convey the density of the layers of trees and small details without drawing every leaf and twig. Yes, it’s quite detailed, but you should see what I left out! As mentioned last week, style, like everything else, develops with time and practice. It’s a joyful journey traveled from drawing to drawing. Have fun!